Wind turbines are like the “nightmare neighbours” | Mothers Against Wind Turbines Inc. Adverse Health Effects, Charter of Rights and Freedoms, fighting big wind. Wind turbines are like the “nightmare neighbours” that are “constantly noisy, constantly in your face,” says a lawyer looking to change the rules that govern turbine approvals. A lawyer for the Coalition Against Industrial Turbines of Ontario says the case has impact all across the province, and well beyond the three projects (in Goderich, Seaforth and Kincardine) where these disputed projects are planned. A crowd of more than 70 people are in court today to support the appeal. Wind opponents say the prospect of health harm from turbines — the noise, annoyance and low-frequency vibration — are all enough to challenge the province’s requirement that there be proof actual harm has taken place. “It’s constitutionally unsound, we say,” Falconer said. “The balance has been lost,” Falconer said, when people are driven from their homes and “have no recourse to protect themselves” because of provisions of the Green Energy Act. One appellant, Shawn Drennan, is opposing a 140-turbine project, 12 turbines of which will be within two kilometres of his home. 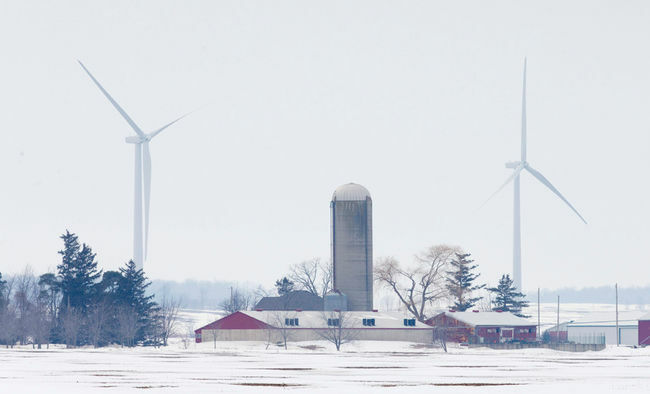 Poll Do you support wind farms in Southwestern Ontario?